The grand Westminster Abbey is the coronation site of monarchs and the final resting place of famous sovereigns and citizens. Virtually every monarch of the nation was crowned in Westminster Abbey, from William the Conqueror (1066) to the reigning Queen Elizabeth (1953). Several thousand people are either interned or memorialized with plaques or statues inside Westminster Abbey. Some earned inclusion with deeds, others paid for the honor. Many kings and queens plus illustrious statesmen, soldiers, writers and musicians are buried here. Many wealthy citizens were able to pay for this honor during the period when the church was in desperate need of money. This ego-tripping eventually cluttered the church's interior, somewhat diminishing its beauty. Many graves are under the floor. To move about, it is necessary and okay for visitors to walk over them, with one exception: The Tomb of the Unknown Soldier. 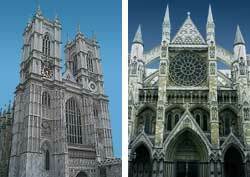 The two main entrances of Westminster Abbey (see photo) have decidedly different architectural treatments. I strongly recommend that you take the Verger Tour inside Westminster Abbey. The Verger guides are knowledgeable and take you to areas that are off-limits to the general public. This includes the magnificent St. Edward's Chapel.